I call it Cushion Food. a beautiful arrangement….on the sofa. Warning: Never talk while you are eating. (Also: Try Leaving a little food for someone who is hungrier than you, or even buy a portion specially). It’s another late afternoon/ early evening in the middle of summer and you are pretending that the weather is OK, even though it is cold and it is raining or too hot and you are fed up. Now is the time to eat something that’s easy…. Let someone bring the food to you or pretend someone has brought the food to you. But what ever…. it can be got ready (in about 4 minutes) and you’ll be ready. Line it up and then settle. 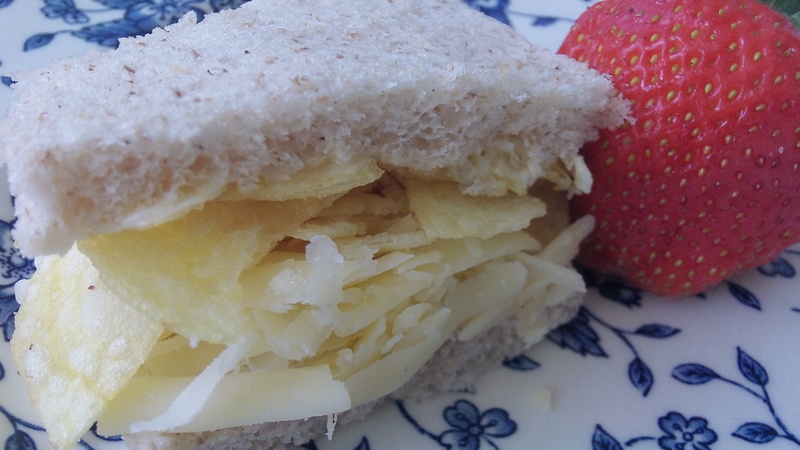 Put a very thick layer of grated cheddar cheese on one of the pieces of thickly buttered bread, followed by a thick layer of rough crushed crisps and cover with the other piece of thickly buttered bread and cut into dainty squares. Serve. Strawberries : get a good supply in. Cheap is good! Cold hard strawberries from the store can be turned into something delicious if warmed…… as if just picked from the field. Fresh English Strawberries (or cold, cheap ones (not frozen) from the supermarket). Andy Warhol famously said everyone should live in one room with a bed and do everything there. So laying around on a sofa is OK! Arrange a burger delivery and join Andy Warhol for a while.There is no need to talk but you will need your own tomato ketchup, any brand.You’ll see Andy eating and not talking because he doesn’t do both at the same time…yet. He is trying to acquire the art. According to his book Warhol reckons he has no class and that it is only very posh people who know how to talk and eat at the same time. Now you know that see how long it takes before he says something! He does right at the end of the clip. Andy rarely talks. He is very minimal! Be patient………. Time for more food again. These can be made ready to eat in minutes. 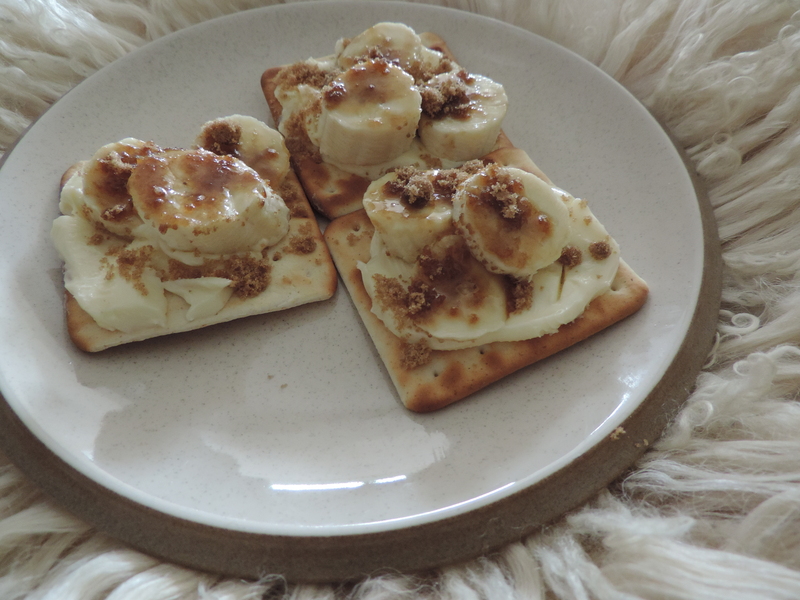 One heaped teaspoon of Dark Muscovado Sugar on three slices of banana on thick butter on one cracker. A word about Soft Dark Muscovado sugar…. It is one of the most important ingredients for cushion/sofa food,so make sure you keep a supply in the cupboard. However it has a natural tendency to go hard and become completely unusable. The packet says ‘In certain weather conditions this natural sugar may harden. This is not a sign of deterioration. Just place the sugar in a basin and cover with a damp cloth. Leave overnight and its moistness will return. The sugar won’t mind’. Yes it really said that! And make sure you have something sparkly to drink. You must realize that I am talking to me about the stuff I like cramming every now and again. You can adapt this format, as I do, with just about anything really! Mostly though …forget philosophers who mostly have nothing better to do but look at their navels…… (except Andy Warhol).